According to the Centers for Disease Control, bed bug infestations have increased in the last two decades. Pet owners may wonder whether their cat can carry bed bugs, and how the cat is affected by them. Do Cats Carry Bed Bugs? The short answer is no, your cat is not going to infest your home with bed bugs. 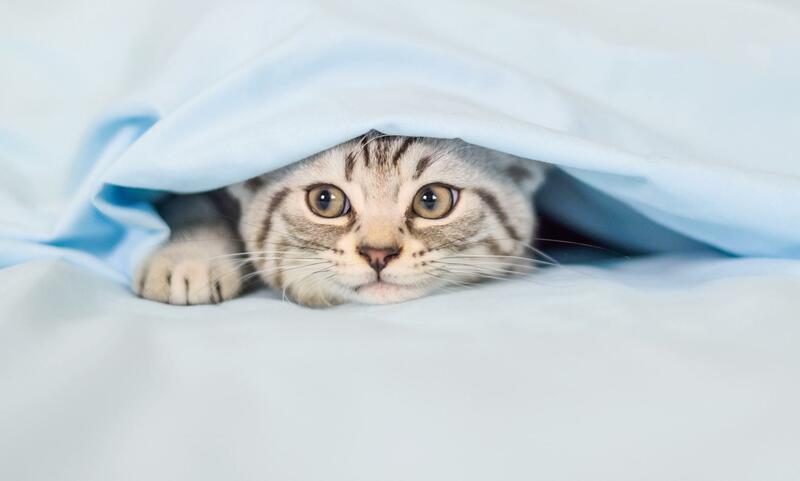 However, the American Veterinary Medical Association says it is possible for bed bugs to infest areas where your cat may be, such as your cat's bed, pet carrier, toys, or even a cat tree. They may even get stuck in your cat's fur and enter the home that way, but this likelihood is small as bed bugs do not live on cats in the way that fleas would. Bed bugs will bite a cat or dog, in order to feed, but this only lasts a short time before the bed bug moves on. How Can I Prevent Bed Bugs on Cats? Before you bring any type of furniture or bedding into your home that is used, look carefully for evidence of bed bug activity. Use mattress and box springs covers and regularly review them for signs of damage. Keep your home clear of anything that can provide a good hiding spot for bed bugs and vacuum at least weekly. If you bring anything home from a place that might be infested, like a motel, store the items in a plastic storage bin or bag and contact the facility. Wash your cat's bedding and toys regularly using hot water. Using the highest heat setting to dry your cat's bedding also helps. Clean cat trees with an isopropyl alcohol spray and a vacuum hose or brush attachment. Using flea collars will not prevent bed bugs although they're still useful for keeping fleas and other parasites off your cats. Will Bed Bug Pesticides Harm My Cat? PetMD recommends working with a pest control professional to remove the bed bugs from your home. Treatment generally involves a round of pesticides although more severe cases may need a whole house fumigation. Let the pest control staff know you have pets to make sure they use chemicals that will not harm your pet. The ASPCA reports that pyrethrin, an ingredient in many bed bug pesticides, has been found to be safe if used properly by a qualified professional. You most likely will have to take yourself and your pets out of your home for a few hours, or a few days if the house needs a total treatment. If you're concerned about the chemicals that will be used, the EPA has a tool on their website to look up bed bug treatments. What if I Find Bed Bug Bites on My Cat? Grooming your cat carefully can help remove any bugs that may still be on their fur. Discuss with your veterinarian if your cat will need any additional treatment, such as a topical ointment on the bites. Your veterinarian may also recommend a medicated shampoo to soothe its skin. Do not use any shampoo for bed bugs made for dogs as these can hurt your cat. Luckily, bed bug bites will not harm your cat but their skin will be irritated as the bites heal, and it's possible some cats might have an allergic reaction. You may also see some temporary fur loss near the bites. Dealing with bed bugs in your home is definitely unpleasant for you and your pets. Thankfully, cats are not responsible for causing bed bug infestations and veterinary treatment for bites is simple. Your cat should be feeling better in no time.